City of Heritage and culture, museums, galleries, shopping & more! The coach will drop you off in Gower Street by the Albert Docks. 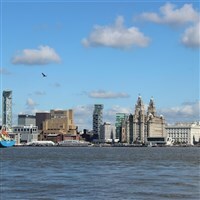 You will have free time in Liverpool to explore as you please. One of the most famous images associated with Liverpool is ferries crossing the River Mersey. Hop aboard, take in Liverpools skyline from the water and gain a sense of its rich history. National Museums Liverpool operates seven museums and galleries including the newly opened Museum of Liverpool, kids favourite World Museum Liverpool, the fascinating Merseyside Maritime Museum, stunning Walker Art Gallery and thought-provoking International Slavery Museum. All are open seven days a week with free admission. Underwater Street in Liverpools waterfront, things are different. Children are in charge. This secret world is set below street level and includes a huge array of exciting hands-on activities for trouble-makers from two to 10 years old. There are six unique zones, three craft tables and a different workshop or show every 20 minutes of the day  more than enough to tire out even the most energetic of children. Theyll be thrilled to discover the climbing wall, the giant walk-in bubble area, the aptly named Imagination Village and even an Elf Bootcamp. Best of all, activities take place around a cafe serving a wide range of tasty meals and snacks  which means parents can sit back, relax and enjoy some well-earnt peace.